Below is a list of errors that have have been identified and have not yet been corrected in the second printing. For a list of errors in the first printing click here . The last paragraph on this page contains two typos. RETRIEVAL AND REPLACEMENT. The concrete stream classes also add another version of the retrieval function rdbuf() , which hides the rdbuf() function inherited from class basic_ios<> . The two functions differ in their return type. The inherited version returns a pointer to the stream base class basic_streambuf< class charT, class Traits> . The added version returns a pointer to a concrete stream buffer type, such as basic_filebuf< class charT, class Traits> . This is the pointer to the contained concrete stream buffer object. The subsequent section explains the subtle differences in more detail. The code sample contains a number of typos. Class istringstream does not have tellp and seekp member functions. They are called tellg and seekg. 15. We use function try blocks for catching exception in these constructors. If you are not familiar with function try blocks, see section G.9 , Function try Blocks, for further explanation. This kind of cast is called a downcast and is performed via the dynamic_cast operator. Section G.8 , Dynamic Cast, in appendix G explains the dynamic cast and related issues. Such a cast is called a peer class cast (see section G.8 , Dynamic Cast, in appendix G for further explanations) and can be safely performed via the dynamic_cast operator. 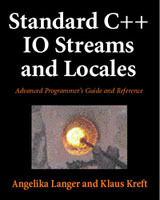 1 There is an ambiguity in the C++ standard regarding the meaning of the character classification flags used by the ctype facet. The standard does not specify how or if the various character properties relate to each other in any way. The result of this ambiguity in the standard is that different implementations of the standard library do different things. Some implementations (e.g. SGI) require that you specify all character properties like in the example above: a lower case character would be classified as ctype_base::alpha | ctype_base::lower | ctype_base::print. Other implementations (e.g. Microsoft) allow that you only specify some of the properties and leave out others because they are implied: for a lower case character you would only have to specify ctype_base::alpha | ctype_base::lower ; the property ctype_base::print can be omitted because all alphabetic characters are implicitly printable. Overrides the base class functionality if it is able to determine more available characters. The same typo in the description of all global functions: the functions return the reference to the stream, that is, i s instead of *this . The return value is is . Failures are indicated by the stream state of is . When no characters are transferred, failure will be indicated by the state of is , and *s will contain only the end-of-string character. The operation calls is.width(0) in any case. Returns is . Manipulator that extracts whitespace characters from the input stream is . Extraction stops when the next character in the input stream is is not a whitespace character or no more characters are available. If the extraction stops because no more characters are available, ios_base::eofbit is set for is . The return value is os . Failures are indicated by the stream state of os . Manipulator that calls first os.put(os.widen('\n')) and then os.flush() . Returns os . Manipulator that calls os.put( charT() ) and returns os . Manipulator that calls os.flush() and returns os . Under the section called "Get Area" function "inavail" should be "in_avail". Returns the number of bytes available, i.e. egptr()-gptr() . If the get area does not exist or is empty (i.e. gptr()== 0 || eback()>= gptr() ) this->showmanyc() is called and returns the result of this call. Returns an estimation of the number of characters that are at least available from the input sequence or –1. If the operation returns –1, calls to this->underflow() and this->uflow() will fail. Otherwise the returned number of characters can be made available by one or more calls to this->underflow() or this->uflow() . The concrete handling depends on the specific derived class. basic_streambuf<charT, traits>::showmanyc() always returns 0. Handles the situation where the get area does not exist or is empty (i.e., gptr()== 0 || gptr() >= egptr() ) and behaves like underflow() , but additionally increases the next pointer of the get area. The concrete handling depends on the specific derived class. basic_streambuf<charT,traits>::uflow() always returns the failure indication traits_type::eof() , because it calls basic_streambuf<charT,traits>::underflow() , which returns traits::eof() . %p , if the extracted value is stored as void*. If (str.flags() & ios_base:: adjustfield ) == ios_base:: internal , and a sign occurs in the character sequence created in stage 2, padding is done after the sign. If (str.flags() & ios_base:: adjustfield ) == ios_base:: internal , and a sign occurs in the character sequence created in stage 2 began with 0x or 0X , padding is done after these two characters.